NOW Liquid Melatonin helps regulate the sleep cycle. 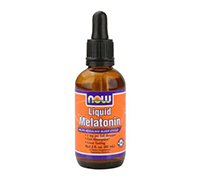 NOW Liquid Melatonin is fast absorbing and great tasting. Melatonin is a hormone produced in the pineal gland, a small gland in the brain, that helps regulate sleep and wake cycles. Very small amounts of melatonin are found in foods such as meats, grains, fruits, and vegetables. It is also available as a dietary supplement, though it has no known nutritional value. Directions: Shake well. As a dietary supplement for adults, take 1 full dropper (approx. 0.9 mL) just prior to bedtime as needed. Take directly or add to your favorite beverage.